Yes, Cookie. 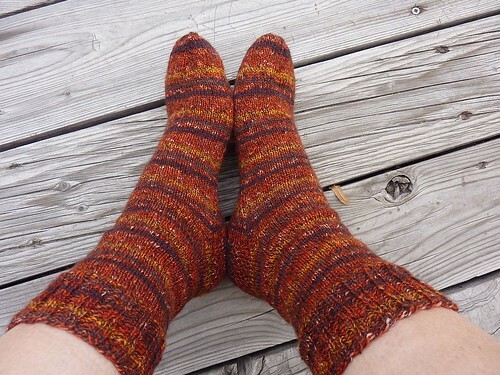 I knit socks. I called these Autumn Joy. They’re just pretty generic socks – top down, 2×2 rib at the cuffs, eye of partridge heel, and star toe. Made from Online Supersocke 100 in “Sierra”. Tons of yarn left over – I should have made them a lot longer. Maybe I’ll cut off the cuffs and do that. Or not. Those will be perfect for all the snow you are getting! Very autumnal! 🙂 Maybe you can turn the leftovers into fingerless mitts or something. You need warm feet today!! And you will be glad you did! They are perfect for the season.